With the 20th Knesset beginning some new faces are appearing on the Israeli political scene, as several freshman MKs - and some former legislators - move into their new offices in Jerusalem ahead of their official swearing-in Tuesday. 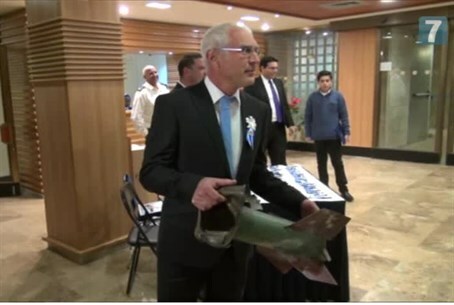 One incoming MK, Yesh Atid's Chaim Yellin, brought with him a rather usual "ornament" for his office: the remnants of a Kassam rocket fired by Palestinian terrorists in Gaza at Jewish communities in southern Israel. "This Kassam rocket is here so I don't forget where I come from and who I represent - the residents that have been suffering from these rockets for 15 years," said Yellin, himself a resident of the Negev. "I brought it from my office in Eshkol to my office in the Knesset I think that it says a lot for me and the residents I represent."